Babies like to be rocked back and forth or side to side, in a gentle manner because of its soothing effects. But even a fit parent will become tired after 15 minutes or more of rocking their child to sleep, and this is where a nursery glider or rocking chair will come in handy. Both serve a common purpose: To provide a parent a comfortable and supportive place where rocking a baby for over 30 minutes becomes more of a pleasure and less of a chore. The rocking motion also soothes the nerves of a frazzled parent. 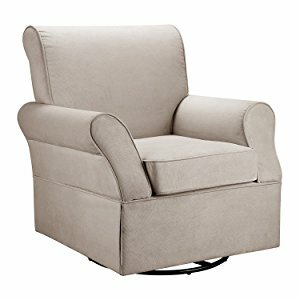 As a parent myself, I know the importance of choosing the right glider or rocker for your baby’s nursery. Here are ten of the best rockers that I believe other parents will find useful in their own homes. A mother’s perfect end to a busy day is putting her feet up while rocking her baby in her arms. 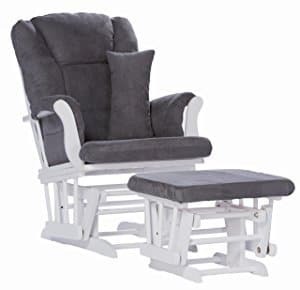 The Windsor Glider and Ottoman set is the perfect place to enjoy these special moments together, especially when the glider is placed in a peaceful and cool environment. At first glance, it looks like any stylish chair-and-ottoman set with its white fabric coupled with gray cushions. But closer inspection reveals that it’s actually a glider with the appropriate mechanism underneath the chair. The chair can hold the weight of a pregnant mother-to-be or a mother with her baby in her arms, even when the leaning back on the chair. The padding on both the chair and ottoman is thick, cushy and comfortable, while the cushion for the chair can be removed for quick spot cleaning of stains. The firmness level is on the medium to firm side, so you won’t get that horrible feeling of sinking into the chair. The cushion can be used for various purposes. It can be used behind your back for lumbar support, under your knees, and under one arm for leverage. Its small size makes it portable for use in other places too, such as on your bed. With its large seating area, both mother and baby can be comfortably accommodated in this chair. Finding the most comfortable position shouldn’t take long, thanks to the chair’s generous dimensions, padded arms, and cushion. The padded arms also provide a sense of being in a cocoon of safety. There are also a few storage pockets on the chair. These can be used to store a few essential items, such as remotes, baby wipes, and bottle of milk, so that you don’t have to keep getting up to fetch them. What's Great About It: The chair requires assembly, but it is easy enough with a few tools and basic DIY skills. Once assembled, it’s a beautiful and functional piece of furniture in your nursery. According to most of its buyers, the Custom Hoop glider and ottoman provides a smooth, seamless and soothing gliding motion. The glider and ottoman also move simultaneously so the glider’s relaxing sensations can be experienced from head to toe. Just sit on the glider, put your feet up on the ottoman, and make a gentle pushing motion. Both seats will start moving in tandem, a mechanism aided by the enclosed metal ball bearings in both seats. The sensation is akin to swinging to and fro on a swing, but in a more relaxed position. Be sure to place oil on the moving parts, particularly the mechanism underneath the glider and ottoman, as part of proper maintenance. There’s a slight squeaking sound after a year or so of regular use when it isn’t oiled in the right places. The chair feels comfortable from the high backrest to the padded armrests and seat. The relatively thick padding can last for several years, but replacements may be necessary due to wear and tear. The fabric used can be spot-cleaned so that the set retains a brand-new look even after a year. Clean stains as soon as possible to avoid them seeping deeper into the material. The side pockets provide a large space for storing essential items that you want to keep handy while rocking your baby to sleep. These items usually include a camera for taking photos, the remote for the thermostat or stereo, and a baby bottle, to name a few. The set is sturdy and stable when assembled properly. The assembly process is easy with the step-by-step instructions included in the package. Both seats can also be moved with relative ease if you need a change of scenery. What's Great About It: The cushions come in a wide range of colors from neutrals to pinks, blues and greens, and are available in either a solid or printed pattern. The wood colors available are white, espresso, cherry, black, oak, and cognac. The set can then be customized according to your preferences. The Dutailier glider is among the most expensive on my list, but it may be well worth the extra dollars. Most of its buyers report that it’s a sturdy, stable and stylish glider that can be used for several years, and will even become a favorite place for grandparents to bond with their grandchildren. The high-quality fabric used on the chair is a blend of 98% polyester and 2% polyurethane. It can easily be spot-cleaned with a clean cloth and warm water, which should remove stains caused by accidents. Its beige fabric may not be suitable for more stubborn stains, so other cleaning methods may be necessary. The seat itself provides a generous space for you and your baby to relax. There’s nearly 4 inches of added space in the seat so your entire body will be properly supported. The back support is also high enough for taller people to recline on. The backrest can also be used for placing the feeding pillows when they aren’t in use. Speaking of the feeding pillows, these are useful for adding padded comfort under your arms while holding your baby in preparation for feeding. These can also be used when feeding your baby on your bed. The glider can also be used in two ways, namely, as a glider and as a standard chair. There’s a locking mechanism that can be released or locked into place depending on the desired use – lock it in position for feeding and release it to rock your baby to sleep. The backrest can also be adjusted from an upright to a reclining position. What's Great About It: The base is made of durable hardwood in an espresso color. The glider provides a smooth gliding motion that lasts for as long as it’s needed, whether it’s for 30 or 60 minutes. This glider has no jarring movement or squeaking while in use. 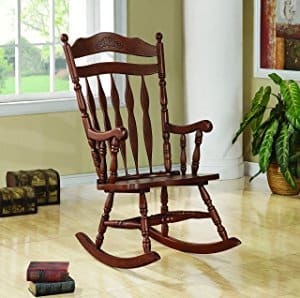 Parents looking for a more traditional rocking chair may find the Coaster rocking chair an excellent choice. The overall design is as classic as it gets with the two arc rockers attached to the four spindle legs providing the rocking motion. The curved armrests and high backrest with the carved details add to its universal appeal for both parents and grandparents. Even when there are no cushions on its all-wood construction, it’s still a comfortable chair where parent and child can spend hours lounging and bonding. If a mother so desires it, a small pillow can be placed behind her back for lower back support and another pillow placed under her arms for added comfort. Tie-on pillows can also be used on the backrest, armrests, and on the seat itself. The rocking chair weighs less than 20 pounds so it can easily be transferred from the nursery to the living room or porch. Such lightweight quality is a bonus for parents who want to expose their babies to fresh air or who want to relax in an outdoor area. 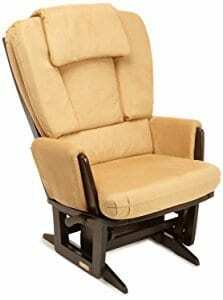 It’s an extremely durable rocking chair even with its lightweight quality. The hardwood used in its construction is the main reason for this stability. Proper assembly is required, but it only takes a short time and a few tools. What's Great About It: This is a beautiful classic rocking chair that can be used even when your baby has grown up. Parents who want an heirloom piece may put this rocker at top of their list. Parents looking for a nursery glider with the whole nine yards may find the Baby Relax Mikayla model as an exceptional choice. The glider immediately catches attention because of its elegant color combination and fine details. 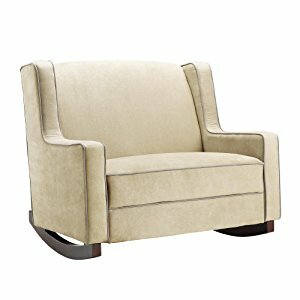 These include the button tufts, contrast piping, and welt trim on the seat and backrest. But it isn’t just a beautiful piece of nursery furniture; it’s also a functional one. The glider’s backrest can be adjusted according to your preferred angle, which can be fully upright or reclined in varying degrees. The adjustable position adds to the comfort, such as upright when nursing or reclined when relaxing with your baby in your arms. The padded armrests provide a comfortable platform for resting your arms, whether it’s napping, feeding, or reading to your baby. The backrest also has a thick padding with medium-firm support. There’s still room in the generous seating area for a small back pillow if you have back issues. The glider is unique because it provides two types of motions – gliding and swiveling. Both movements are smooth and seamless so your baby isn’t subjected to jarring motions. The gliding motion is obviously the most popular among parents because it soothes a fussy baby better than a rotating motion. The large seat can accommodate an average-sized adult and an older child. The base itself is strong and stable so there’s little risk of tipping or toppling over while sitting in the glider. What's Great About It: Even with its numerous parts, the Mikayla glider is fairly easy to assemble with basic DIY tools and skills. As soon as it’s assembled, it’s ready for use, whether in the nursery or in the living room. 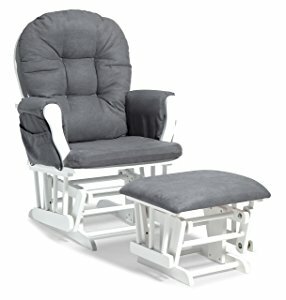 The DaVinci glider can be used from a baby’s infant days to toddler years, so parents looking for a good value for money chair may want to look it over. This is a stylish glider that will blend in with the décor of a nursery for either a boy or a girl. When your baby grows older, the glider can be used by both parent and child. Nearly everything that comes into contact with your skin has a thick padding for added comfort and support. The high backrest fits both petite and tall users, although the level of support will differ. Aside from the cushioned backrest, there’s also a small support pillow that can be placed just behind the lower back for good spinal alignment. New mothers will appreciate it because pregnancy affects their posture, so lower back support when sitting is essential. Even the ottoman has thick padding so that the legs, knees and feet have a comfortable place to rest. Many pregnant women use the glider and ottoman when their doctor advises them to elevate their feet. Plus, the relaxing feeling of being rocked to and fro applies to both adults and babies. The glider also has a 360-degree swivel motion. While it shouldn’t be used in soothing a fussy baby, it’s a useful feature for checking up on your older kids without getting up from the glider. The metal base is extremely sturdy, and guarantees thousands of forward and backward gliding and swiveling motions. The 100% heathered polyester fabric used for the seat is both soft and strong, a desirable combo in products that parents and babies use. This is also 100% safe as a baby product as there are no chemical flame retardants used in its production. What's Great About It: The DaVinci glider comes fully assembled, so you won’t need to fuss with set up. This is a cross between a padded armchair and a rocking chair, as evidenced by the two arcs supporting the chair. The thickly-padded seat, backrest and armrests are like beacons for a tired parent who still wants to spend quality time with a newborn. This can be paired with an ottoman for putting your feet up. The foam used is high quality with medium firmness. There’s a feeling of being on the seat instead of in the seat due to the resistance offered by the thick foam. This is the preferred firmness for mothers who appreciate a greater amount of support without sacrificing their comfort. The seat itself is wider than a regular rocking chair’s seat. More space for your arms and elbows to stretch is available, not to mention that a mother and older child can sit together side-by-side. The wider space is also useful when additional pillows are placed under the arms, especially during feeding time. The 19.5” seat height is suitable for most adults. Since there’s no adjustment mechanism, it can be an issue for shorter and taller people. Certain steps can be taken, nonetheless, such as placing a platform under the feet for petite mothers or placing more pillows on the seat for tall moms. This is a contemporary rocking chair in terms of design. The clean and crisp lines combined with the 2-toned contrast details make it a suitable addition to any modern nursery, especially when the parents aren’t interested in traditional rocking chairs. The beige fabric may be an issue for some parents. But since the fabric can be spot-cleaned, it’s a minor issue that can be solved by placing a protective cover, like a shawl, over it. What's Great About It: The wider seat accommodates even a larger person without the rocking motion being compromised. There’s a gentle rocking motion too, which soothes mom and baby. The cream cover on the 100% polyurethane foam of the Brisbane glider and ottoman set doesn’t easily become dirty despite its appearance. The trick is to clean accidents using spot cleaning methods as soon as they happen. The fabric also doesn’t absorb stains quickly, but for hygienic reasons, a cover like a small blanket should be used. For stubborn stains, the cushions can be removed and washed in the machine. The glider has a maximum capacity of 250 pounds, so mother and baby can be safely seated in it. But it isn’t suitable for use by a parent and a small child sitting side by side due to its standard size of 25.75” wide. There’s sufficient seating room, nonetheless, and the ottoman holds up your feet nicely. ​Both the glider and ottoman have ball bearings that make them move smoothly and simultaneously. The gliding motion is akin to being on a gentle swing, so your baby’s head isn’t shaken. ​The 15-minute assembly time is a plus. There’s also a wrench provided, as well as easy-to-follow instructions. What's Great About It: Since it’s a stylish glider set, it’s a great addition to almost any room in the house. This is a lightweight set too, so transferring it between rooms is easy and quick. The supremely smooth glide of the Tuscany glider set puts fussy babies to sleep faster than expected. The metal-enclosed ball bearings make the smooth motion possible, and also ensure its longevity. Be sure to follow the manufacturer’s recommended maintenance measures to maintain the soothing gliding motion. There’s also plenty of seating room for you to sit with your baby in your arms. The padded armrests are wide enough to accommodate both you and your baby without feeling constricted. The seat can also accommodate a parent and a toddler for reading time, but it depends on their respective sizes. The pocket at the side is a convenient storage area for various odds and ends for your baby, such as baby books and toys. The thick cushions on the backrest and seat make lounging such a joy, and your child will enjoy using it when they grow too. ​There’s a lumbar pillow included with the set. This is used for supporting your lower back, which many moms say is a common site for muscle aches. What's Great About It: The glider can be customized in terms of wood color and fabrics – there are 6 wood types and 4 fabric choices. The durable construction ensures that it can be used long after your baby has grown up, provided proper maintenance is done. This looks like a regular padded armchair and ottoman due to the long skirt detailing. But when you look under it, the glider mechanism and its true purpose are revealed. The detailing, nonetheless, gives the set a polished look since there are no mechanical systems to be seen. The clean lines evoke the contemporary sensibility of most Baby Relax gliders. The contrast piping on the main glider and ottoman adds to its simple yet stylish appeal suitable for a modern nursery. There are three colors to choose from – gray, chocolate, and beige. The thick medium-firm padding provides the right balance between comfort and support from the back to the bum, as well as for the legs and feet when placed on the ottoman. What's Great About It: This glider can be converted into a piece of furniture for your child’s bedroom after it has seen its use as a glider for mother and baby. 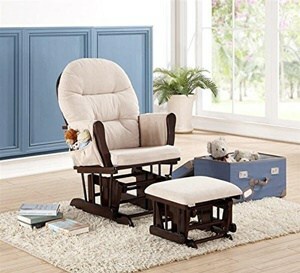 Gliders and rockers are common furniture items in homes where newborns, infants and toddlers are present. But few people know about their nature and purpose, as well as their proper use. Here are a few things that I discovered during my research and personal experience with them. While the terms “gliders” and “rocking chairs” may be used interchangeably, they are different in many ways. Knowing the difference will have a significant influence on your choice between the two. On one hand, a glider is actually a subset of rocking chairs, so there’s a rocking motion involved too. The seat is permanently attached to its base via a double-rocker linkage with four bars. The linkage’s non-parallel suspension arms make the glider swing back and forth, just as with a traditional rocking chair. A glider has the added benefit of a matching ottoman that moves simultaneously with it. The smooth movement is often described as floating on clouds while swinging in a gentle motion. On the other hand, a rocking chair consists of two bands of curved wood attached to four straight legs that support the seat. Each rocker, the alternative name for the curved wooden band, has two legs attached to it. The seat itself usually has a high backrest and two armrests. The rocking motion comes from either pushing on the floor using the feet or shifting the weight. But it isn’t just the rocking motion that promotes relaxation of the mind and body. When a person sits on it and reclines backward without rocking, the relaxed angle and position promotes calmness and relaxation. Which is the better choice? It depends on your personal preference. You may choose a glider because of its armchair-like design complete with cushioned seat, backrest and armrests. You may prefer a traditional rocking chair because there are no mechanical components that require regular or proper maintenance. Whatever your choice between these two types of furniture, it should ideally be chosen based on the following criteria. Just as with all baby products, safety for both baby and parent is of paramount importance. The glider or rocking chair should be strong and sturdy enough to hold the weight of a parent and child, usually from newborn to toddler. The frame should be made of durable wood or metal, perhaps a combination of both in case of modern rocking chairs. Read and comply with the manufacturer’s weight restrictions for safety reasons. Many gliders have been recalled because of their bad construction, such as when the base breaks while the occupants are gliding. Be sure to check for jagged edges, exposed mechanical parts, and small gaps that can become hazards for a young child. Traditional wooden rocking chairs aren’t as comfortable, in terms of cushioned support, as contemporary gliders. 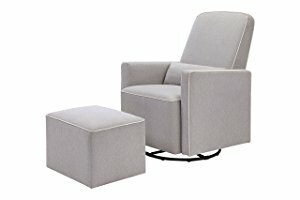 But these can be made more comfortable and supportive by adding tie-on cushions for the backrest, armrests, and seat, as well as adding an ottoman. Even the addition of a small back pillow can increase the comfort level on these pieces of furniture. Contemporary gliders are usually padded from the backrest and armrests to the seat, so comfort isn’t an issue. But it’s still important to check that a glider provides the desired comfort and support level, such as in the height of the backrest and the width of the seat. Taller and larger people, for example, will benefit more from larger-than-standard gliders or rocking chairs. Check that your feet reach the floor in a comfortable manner while your arms rest well on the armrests. Lean back on the backrest to determine whether a small back pillow is needed to support your lower back. Place a small pillow under your arms in case the armrests are too wide for you. A locking mechanism makes it easy to stand up from the glider with your baby in your arms, as well as reduces the risk of a toddler’s fingers and toes being caught in moving parts. 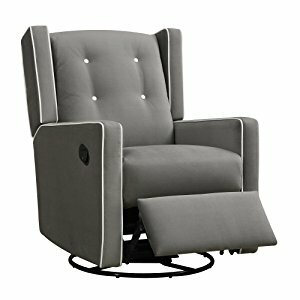 A reclining feature comes in handy when soothing a fussy baby, while the swiveling action makes it easy to change the direction you’re facing. Most of the gliders and rocking chairs on my list are easy to assemble with few parts and tools needed. These are also easy to maintain with immediate spot-cleaning, occasional oiling and regular washing as the only things you need to do. A few of these chairs even have removable covers for quick washing in the machine. If you’re purchasing online, you should check the returns and refunds policy. You may have to ask for a replacement on defective parts or for the entire unit itself. Place it in a cool and comfortable area of the nursery. But be sure to avoid placing it near the radiator or air-conditioning unit, as well as beside the window in direct sunlight. Check its moving parts to ensure that everything’s in proper working condition before using it for the first time. This is especially true for gliders with ball bearing mechanisms. Perform regular maintenance checks since moving parts may need maintenance, whether it’s placing oil or adjusting settings. Never rock too hard while on it since the vigorous motion can be dangerous for your baby. A baby’s brain can easily become injured when it makes contact with its skull too many times or too hard. Gentle rocking motions are always best. Avoid falling asleep on a glider or rocker. While it may seem charming, your baby can slip out of your arms or be suffocated in your arms. A rocking chair or glider is a great way to snuggle up to your baby without the sore arms and feet that comes from carrying them as you make gentle rocking motions with your body. 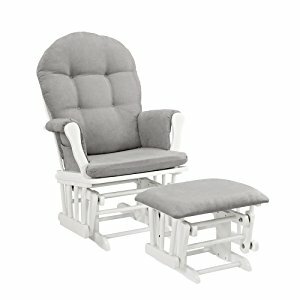 In the end, the best rocking chair or glider meets your unique needs and wants. You can refer to my list of recommended products and my buying guide so that you can make your own informed decision.